Must See - 413 Greenbryre Lane Saskatoon - Slade Real Estate Inc.
Show stopping executive Bungalow Built by the reputable builder Decora Homes. Over 4600ft of exquisite development. 2383 sqft on the main level. 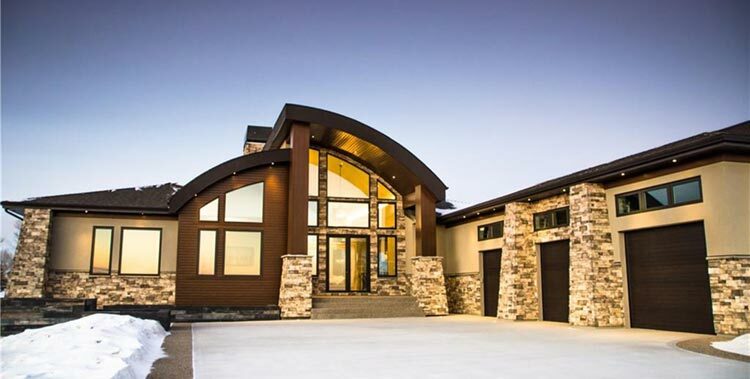 When it comes to style, design, features, and fit and finish; this home boasts it all. Located on a beautiful walk-out lot. This 2 acre oasis is ready for you to call home. From the moment you approach this property you get a sense of grandeur and luxury, however, there is an at-home feeling the moment you step inside. Ideal for large families or people who enjoy entertaining; main floor and basement will surely impress. The foodie in you will love the gourmet kitchen; equipped with Luxor Cabinets, JENNAIR pro-series appliances, and 3″ quartz countertops. The separate coffee station/bar is ideal for those early mornings; or late nights. One of the many show stopping pieces of this home is the poured-in-place concrete wall which allows for the floating oak tread custom designed staircase; complete with a hand-forged iron railing. This gorgeous piece leads to the walk-out basement equipped with an entertaining hub and enormous wine bar that mimics the staircase design. A very comfortable and cozy family room with a tindle stone mantle and fireplace. Too often the mechanical room gets overlooked, however, this room is as equipped as the rest of the house with in-floor heat, on-demand hot water heat, and the Control4 audio centre. Last, but not least; the exterior. 56ft triple garage will easily accommodate 3+ cars and toys, sweeping concrete driveway, front landscape to be completed come spring. The expansive rear deck has a beautiful private view of the golf course along with an outdoor fireplace and television centre. Ideal for those beautiful Saskatoon summer nights.